UK Government Recruits Canadian Mark Carney To Rescue Britain from Bank of England Incompetence! The UK government blinked by throwing out the favorite Paul Tucker and appointing Mark Carney with near universal mainstream press approval, the first foreigner in the Bank of England's 318 year history to replace Mervyn King as the next Governor of the BoE, whose term office in virtually every respect has been a complete and utter failure, be it failure to regulate Britain's banking sector that continues to be a drain on UK tax payers, failure in terms of UK economic performance and not forgetting the failure of the BoE's primary remit of keeping CPI Inflation at 2%, instead we have seen inflation soar to over 5% despite economic depression. The usually inept and incompetent Chancellor George Osbourne, who tends to back track on virtually every decision he makes, has instead opted for an outsider from Britains banking establishment, Mark Carney who apparently is said to have a solid track record in the steering Canada's banking sector away from the abyss that the UK, US and much of the rest of the western worlds banking system fell over following the collapse of Lehman Brothers in September 2008, though in reality that ball had been set rolling towards financial armageddon well over a year earlier following the collapse of two Bear Stearns hedge funds in July 2007 that sparked the credit crisis that sent shock waves through the financial system that led to the collapse of Lehman Brother's and Financial Armageddon. Still Canada avoided what befall the vast majority of western banking sectors and much of the credit for which is being placed at the feet of its central bank governor, though in truth it was probably more as a consequence of the still deep memories of the pain that followed the debt crisis hole that Canada had to dig itself out of during the early to mid 1990's via deep spending cuts. 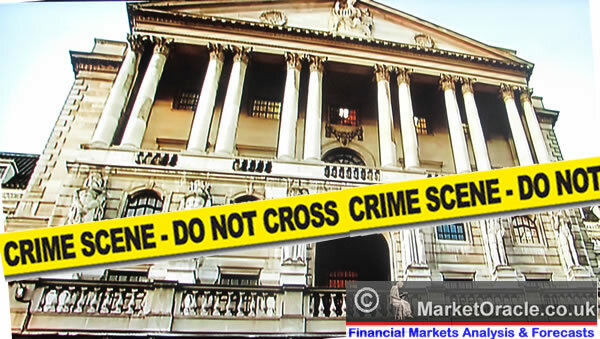 However, the Governor of the Canadian central bank did play it safe in the lead up to the 2007-2009 crisis, unlike those at the head of the US Fed and Bank of England who were found to be sleeping on the job as they clearly served the interests of their Bankster brethren rather than governments or the tax payers who were forced to take on unlimited liabilities so that no bank would default on its debts owed to fellow bankster's. 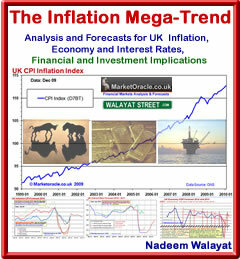 What Difference Will Mark Carney Make to Britains Money Printing High Inflation Trajectory? Under Mervyn King's governorship, the The Bank of England's primary objective has been to pump put economic propaganda of always imminent deflation so that it could get away with ramping up the Inflationary money printing presses (electronic) to both bailout the banks and to monetize the UK governments deficit and rolling debt mountain that I have documented in detail numerous times over the past 3 years as illustrated by the Jan 2010 Inflation Mega-trend Ebook (Free Download) that warned of a decade of high inflation as a consequence of central bank money and debt printing. Therefore the big question mark is Will Mark Carney Impact on this mega-trend or not? 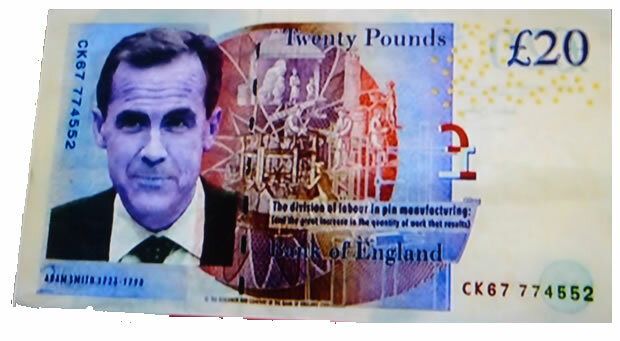 There is much hope that Mark carney will be tough on Britain's banks who have had a free reign to literally get away with criminal activities due to conflict of interests at the Bank of England and the incompetence of the Financial Services Agency (FSA) that operates as a revolving door between regulators and the banking sector. Whilst Mark Carney is said to be an outsider to the London bankers club, however he still has close links to the banking establishment as illustrated by having worked at the London office of Goldman Sachs. Also the main problem that I see is that whilst he may well be tougher on the banks than Merryn King ever was, i.e. in terms of banks being pressurised to lend to small businesses, however in terms of impacting on the programme for money printing government debt monetization, he will only make a marginal difference because it is what all Governments request from their central banks, which is to print money / debt so that politicians can buy votes at elections, and with the next general election just 2.5 years away, the last thing on the Coalition governments minds will be any vote losing policies such as cutting bank on the QE drug that the economy is hooked on, which as I warned several months ago (20 Jul 2012 - The Quantum of Quantitative Easing Inflation is Coming! ) has now morphed into the next stage of QQE. The bottom line is that whilst the UK can now expect more effective bank regulation, however there will be no real change to the high inflation consequences of the secret policy of QQE. To get my next in-depth analysis on what QQE means for Inflation and Britain's debt crisis in your email in box, ensure you are subscribed to my always free newsletter. I was hoping you might revert back to doing some market analysis soon (e.g. DOW or FTSE 100 indices). Do you have an opinion on where the US dollar is likely to be over the next few months? Yes, I have been dancing around the mountain of work that I need to get done. And this mountain of work is the housing markets. For whcih I need to do a load of work, first on debt dynamics, then economy, then inflation, and eventually I arrive at the housing markets proper and implications thereof. I could decide to forget the above and just analyse trading markets such as stocks and the dollar, or splice them in between stages before year end. 01 Dec 12, 16:00 Uk house prices? Still eagerly awaitng your forecasts for the housing market that you promised many months ago, hope it won't be too long. My analysis articles tend to be written in parallel rather than series as I am not working towards churning out regular content for a subscriber base but rather towards arriving at the most probable outcomes. For instance, for the past few weeks I have been working on 7 articles in parallel that I intend to publish over the next few weeks, though unfortunately I have yet to reach the stage before I can even begin UK housing market analysis. I will within the next few hours publish an important article on Britain's debt dynamics which will flip the whole deficit debate on its head.